But because I like it, I want to see it done well, so I have some minor complaints! (death radius / birth radius) ~ [(log n)/(log log n)]^(1/k). That is really short! And it makes me feel like there actually is something going on, when you see a long barcode in practice. I like Cathy’s take on this famous probability puzzle. Why does this problem give one’s intuition such a vicious noogie? It is relevant that the two questions below have two different answers. I have two children. One of my children is a girl who was born on Friday. What’s the probability I have two girls? I have two children. One of my children is a girl. Before you came in, I selected a daughter at random from the set of all my daughters, and this daughter was born on Friday. What’s the probability I have two girls? At last week’s AIM conference on chip-firing I learned about a cool stochastic process which seems very simple, but whose behavior is apparently very hard to prove anything about! It goes like this. You start with a graph (say a finite connected graph, for simplicity) and your states are functions from the vertices of the graph to the natural numbers, which you think of as specifying the height of a pile of chips (or sand grains, if you want to keep up that metaphor) sitting on top of that vertex. At least one of the vertices is a sink, which means that any chip landing there disappears forever. Now the nature of the process is that you never want to have more than one chip at a vertex. So every time there are at least two chips at a vertex v, you can pop two of them off; each chip flips a coin and decides whether to topple left or right. And you keep on doing this until there’s at most one chip at each spot. (You might start with more chips than vertices, but the sink helps you slough off the surplus.) This process was apparently first studied by Manna and is sometimes called the Manna sandpile. More math below the fold! Why are the Orioles performing over their Pythagorean record? Weird, right? The Orioles allow very few runs frequently, and a lot of runs frequently, but don’t allow runs in that 3-4-5 range very often. Their distribution of runs scored shows a much more ordinary shape. Could this be explaining the Orioles consistent ability to win games despite allowing more runs than they score? It’s not out of the question. Imagine a team that allowed 0 runs 40% of the time and 5 runs 60% of the time; that team would allow 3 runs a game on average. Suppose they scored exactly 3 runs every single game. Then they’d score exactly as much as they allowed, so their Pythagorean WP would be .500. But in fact they’d be a .400 team. So I checked this for the Orioles — if each game had an RS and RA drawn at random from the distribution above (I got the exact numbers from baseball-reference, actually) it turns out that you’d get a winning percentage of .479, which gives 58 or 59 wins out of their current 122 games played. Their Pythagorean WP is .456, which predicts 55 or 56. 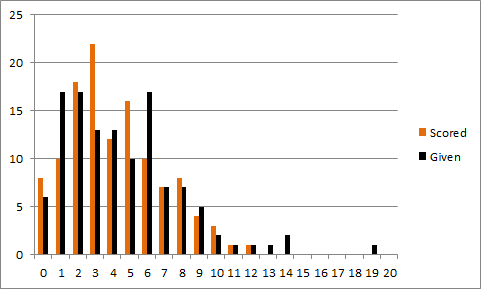 So the Orioles’ weirdly bimodal RA distribution is indeed helping them beat Pythagoras, but only by 3 games or so; why they’re 10 over Pythagoras right now remains a mystery, and is probably just some combination of great bullpen and great luck. A few months ago I posted a puzzle about aggregating probability estimates from different sources, and in particular how to aggregate opinions about the independence of two events. To save you a click, the question amounts to: if half of your advisors tell you that X and Y are independent coins with probability .9 of landing heads, and the other half of your advisors agree the coins are independent but say that the probability of heads is .1 for each, what should your degree of belief in X, Y, and X&Y be? And should you believe that X and Y are independent events, a fact about which your advisors are unanimous? On one account, probability is a number between 0 and 1 that represents your degree of belief in a hypothesis, and independence of X and Y means that Pr(X&Y) = Pr(X)Pr(Y). Both are assertions about your mental state. So there’s no reason that the unanimity of your advisors about the independence of X and Y should make you believe that X and Y are independent; why should this aspect of their mental state automatically be taken to be a guide to yours? Relevant comparison: what if each advisor said “I am really sure my belief about the coin is correct.” Since all your advisors agree that the nature of the coin is very strongly certain, should you agree about that too? No — given that half your advisors think the coin is very likely to fall heads and half that it is very likely to fall heads, you are reasonably pretty unsure about the nature of the coin. Moreover, if X falls heads, you should rationally increase your degree of belief that Y will fall heads too, because X falling heads is evidence that the 0.9 gang is correct in their beliefs. So (for you, even if not for your advisors) the two events are not independent. There is another account, in which the probability is an intrinsic property of the coin. On this account, it makes sense to talk about second-order probabilities: to say, for instance, that the probability that “the probability that the coin falls heads is .9” is 1/2. On this account, we can talk (as Terry does) about conditional independence; we say that there is an unknown parameter p which measures the propensity of the coin to fall heads, and that the condition Pr(X&Y) = P(X)P(Y) for independence only makes sense once P(X) and P(Y) are known. In fact, I’ve come to favor the second view, at least as regards coins. Because here’s the thing. Let’s say I start with the first view. I have in mind a degree of belief that the first coin will fall heads, and I call this P(X). Given the evidence I have, probably P(X) should be 0.5. But once I’m forming degrees of belief, I must also have a degree of belief that a sequence of k tosses of the coin will all fall heads. And this should be the average of (0.9)^k and (0.1)^k, not (0.5)^k! Having in mind the probability distributions on “number of heads in k tosses” for all k is, by De Finetti’s theorem, more or less the same as having in mind a probability distribution on the propensity of the coin to fall heads. That is, if a binary event is one we can imagine repeating, then our subjective degrees of belief about the event automatically have the structure of a second-order probability distribution on (Bernoulli) probability distributions. In fact, I think this was why De Finetti proved De Finetti’s theorem. In this context, independence is an intrinsic fact about the coins, not about our knowledge, and we should agree with our advisors that the coins are independent. I’m less sure this story applies to uncertain events which are, by their nature, unrepeatable. What do we mean when we talk about the probability that Ankylosaurus had feathers? Is it meaningful in this context to say “I think there’s a 50% chance that there’s a 90% chance Ankylosaurus had feathers, and a 50% chance that there’s only a 10% chance” or is this exactly the same as saying you think there’s a 50% chance?